I have been pretty productive over the past few days IMHO, now that I'm feeling almost 100%. You may recall I made this top during the Craftsy Sweetens Up My Quilting Life hop that Julie of Pink Doxies and I hosted earlier this year. 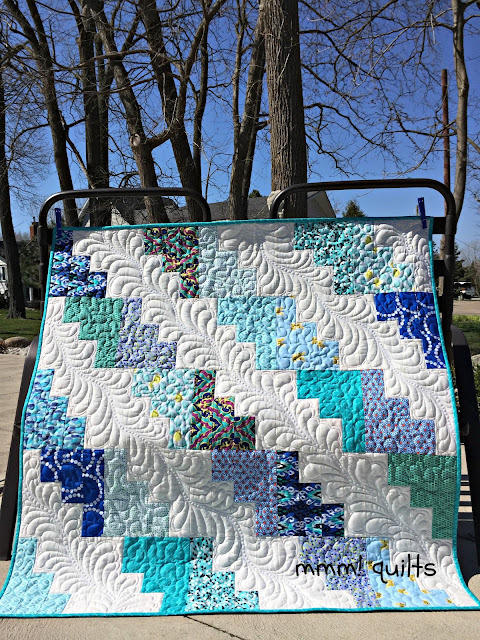 This was a 10-yard bundle of blues, from which I whacked off a 2.5" strip of each print, added in the Pearl Bracelets, another aqua print and some Kona Snow yardage, and made these blocks. This quilt was inspired by this one made by Preeti, who in turn was inspired by a Cluck Cluck Sew pattern. Looking at mine, there is not a lot of resemblance to the Cluck Cluck Sew one, but I always give credit where credit is due. I absolutely LOVE the turquoise Treasures of the Gypsies print by Northcott, bought some time ago with a backing in mind, and some has been used as such. I knew I had a blue skies-type print somewhere in my stash and had just enough to add in a strip. Rather à propos, n'est-ce pas? What a gorgeous day, finally, here. Temperature not where I need it to be, but still, a helluva lot warmer than it has been, and with the sunshine, birdsong (saw my first cardinals this week!) and blue skies, I'm a happy girl. I think it was Cindy of Stitchin' At Home who said she could see some of my beloved feathers flowing along the white areas, and she was right! I wasn't sure about fitting them in there, but it worked out great. I drew the spine freehand with a blue marker (thanks Tish! Love those babies) and then just went for it with drawing in the feathers. Soooo good to be back on Avril. I also decided to echo the spine and then fill it with pebbles, as you see. I picked up some polyester batting at JoAnn's this winter to try, since I love-love-loved the Legacy polyester I got to use last year in the wheelchair quilts for our guild. It's not quite as soft as the Legacy but it quilts up just as beautifully and has a light airy feel in the quilt, and it shows off such texture! I just meandered (ahh, love meandering, SO relaxing) in the blue sections. Okay. Let's be frank. Open. Honest. Full disclosure. 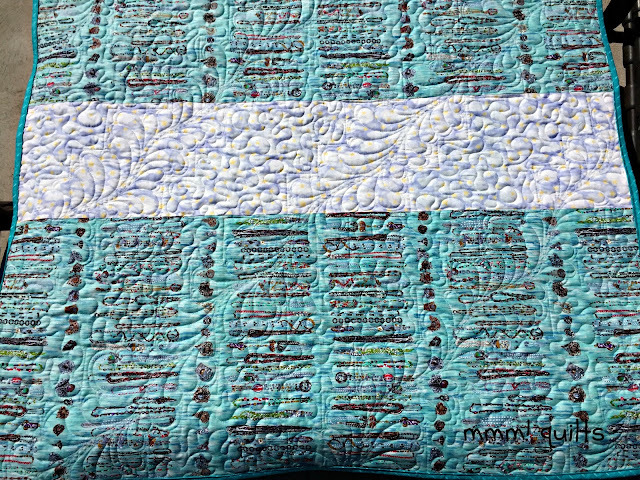 At several points during this first quilt on Avril in 3 months, I was sweating, doubting, thinking, "Crap, missed touching the spine there; oops, those pebbles are not round; nooo, that feather is not curved properly; yikes, that feather looks like a cat's broken tail..." and so on. However, I did not rip. Did not stop. Well, that's not true; I did stop to fiddle with the tension, which went off slightly as the bobbin emptied, and then was refilled (I went through 2 bobbins of So Fine that I wound and part of one The Bottom Line pre-wound one). So my point is that it looks great, no? I'm really pleased with the entire quilt from colours to quilting. When your nose is up against a quilt, and you're seeing every. single. stitch. it's easy to beat yourself up huge-time. Try to step back and get the overall effect. You probably will go "Yuss!" to quote Judy of Quilt Paradigm. There is already a MMMquilts on Etsy!! Noooo.... So now what? I got nuthin'; somehow "Menopausal Quilts" doesn't sound like a business I'd like a quilt from, LOL. Any suggestions welcome. I thought 3Mquilts...m3quilts... I also thought $65CA. It's a baby quilt, or a small lap quilt, not that big. Thoughts on that appreciated. I've seen them a lot more expensive, but, as with my first quilt pattern that is free on Craftsy, I thought I'd start humble. This is Fisherman's Wife Cowl, a kit that is only $12.88CA on Craftsy, and that will knit up in no time with this lovely chunky acrylic/wool blend yarn and fat needles. Perfect for spring with the ever-present wind here in flat Essex County! 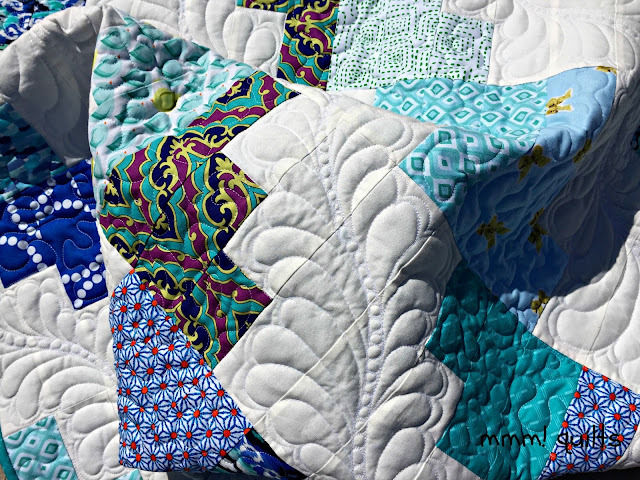 You know I already loved the quilt but it was fun to read your post :-) How about Quilt Musings? Love this promise of summer skies with feathers that just breeze through the blocks. It is even prettier after quilting. How about Sandra Quilts? 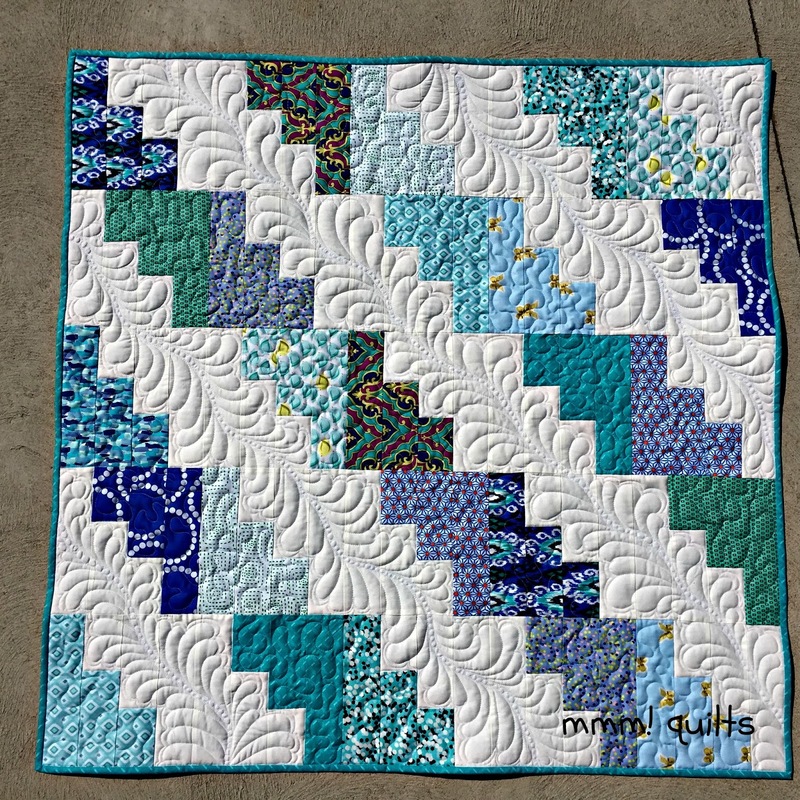 The feathers look amazing to me - it adds great movement to the quilt top. Oh man, bummer about MMMquilts being taken on Etsy. 3Mquilts makes me think of 3M (which while they make sticky notes that are cool throws me off); M3quilts leads me to think of MCubedQuilts, which I kind of like more; and There is also Musings Quilts potentially... ? 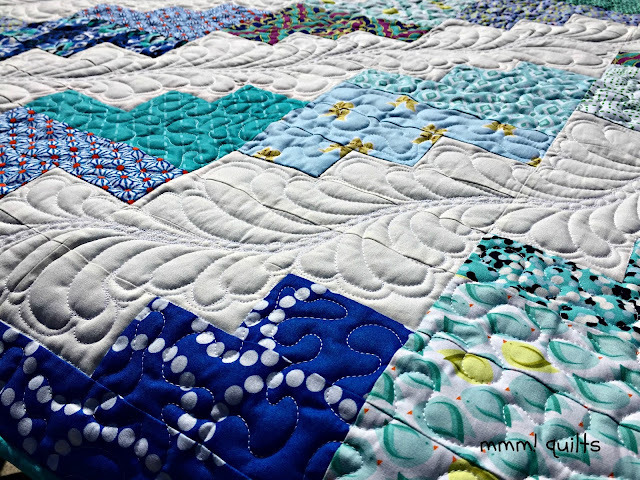 I love that quilt, and what your amazing quilting does for it! Congratulations on starting your Etsy shop, too. I can only imagine that your quilts will sell like crazy! Here's hoping the weather warms up for you soon. My sister-in-law and her husband just tried snowbirding for the first time this winter, and came back the end of March. Now we are predicted to get a foot of snow this weekend! Crazy spring weather! Oh that's BEAUTIFUL!!! And hurray!!!!!! I've been pestering you for how long, to open the Etsy store? congrats!!! Why not MMM!Quilts? With the exclamation point? Your feathers are stunning from here! Oh don't start that humble Sandra! I'd ask at least double that. Really pretty baby quilts like this go for over 120 US bucks easily! Yus! - it does look perfect and those feathered paths are gorgeous! I can't believe MMMquilts is already taken. 3M sounds like the corporation and does not bring to mind handmade beauty. Maybe you should play more with the "Musings" part of your name? I absolutely love this quilt and the feathers! Why not go with something like Sandra's Quilt Musing, Or Musing with Sandra's Quilts. What a beautiful quilt! The feathers are stunning!! 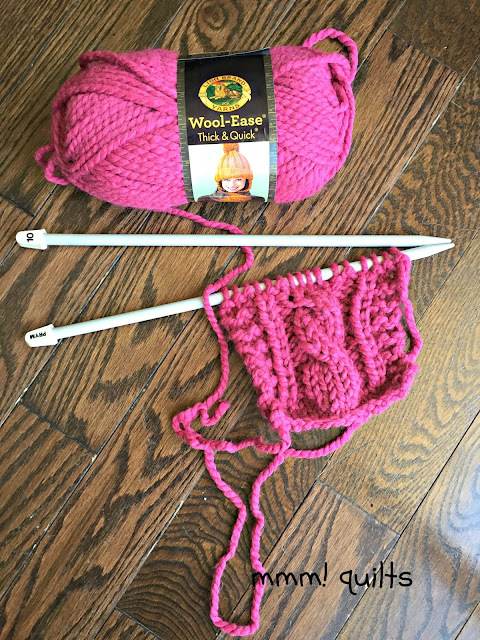 I love the yarn for your cowl too - and I know what you mean about the wind - I'm just over in Middlesex county, and we've had no end of cool and windy days here - thankful for today's sun! What about Sandra's MMM Quilts? Makes them sound yummy / appealing...! Yuss!! :D Holy crap, Sandra, it is spectacular!! I want to rub my face on all that quilty texturey goodness! 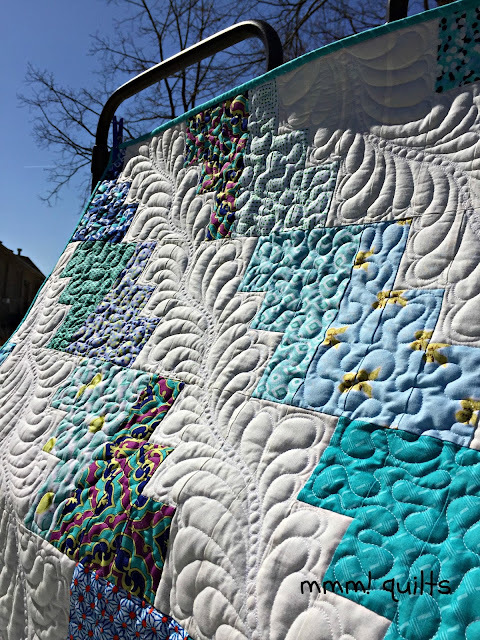 The outside pictures pick up the quilting so fabulously! So beautifully done and yay for you for no ripping!! From what I can see here - there was absolutely no ripping required. You nailed this one! Wow, another stunner. I agree with others about the cost you are planning. Humble is one thing, but underselling yourself is another. So beautiful, colours, feathers, the works. Your quilt is beautiful, Sandra! And NO NO NO do not list it for $65CA! Unless you want to always have to make your quilts at a loss... In addition, underpricing your product hurts everyone who handcrafts to sell. There's a long discussion there, but it makes sense that if cheap Chinese products make it harder to sell our own handcrafted items, so do people who underprice their creations. I have a form that I use to figure out a fair price for my work - I'll email it to you. I did a quick figuring of what I think it would sell for, just guessing on a few things like how long it took you to make it, and I come up with about $147US, or about $185CA! Such wonderful quilting - just love your style. Beautiful! I think my favorite part is how suited the feathers are to the quilt, as if you planned the patchwork around the quilting. The pebbled spine really steps it up to. I have sold a few Quilts in my Etsy shop, and quite a few that just sit. Interestingly, my sales have been those that were priced a bit higher, baby Quilts over $200, & lap size over $500. I think buyers are perhaps suspicious of quality when priced too low. Such a hard call though, when there are so many offered there for low prices. At 40" sq., beautiful fabric, quality binding, & custom quilting I recommend $140 at least. It photographs so well , I think you may be pleasantly surprised! Good luck, and with the shop name too! TripleMQuilts? You have inspired me to try feathers, perhaps I will design my next patchwrk with that in mind! Sandra, it is stunning! Love the quilted feathers with the pebbles in between. I think you should DOUBLE your price. Your workmanship is outstanding. As for your name, if you included both words or a variation of musings and quilts it would be more descriptive. Good luck on deciding on a name. Ooh, pretty! And like many others have said, you're undervaluing your work. I don't think $65 covers your materials, let alone your time and expertise. Underpriced quilts are why uninformed people think quilts priced to at least cover cost of materials are overpriced! Your work is beautiful, and I really think it will find a buyer who will appreciate the true cost. Doubling your $65 is definitely not out of line! That's my two cents :) Sorry, I don't have any input on a shop name. Good luck! Hi Sandra: What a truly beautiful quilt. I'm all for doubling the price and maybe even going higher. I like the name Quilt Musings that Vicki suggested. This is beautiful! I'm glad you stepped back before ripping. It didn't need it. I vote for Sandra's MMM Quilts. You already watermark your photos with MMM Quilts, so I would try to stick with it. I also vote for doubling the price. Love the colors in this quilt and the quilting is, of course, gorgeous. I'm tuning in late on this so will be interested to see what you do about your Etsy name. Beautiful quilt! Before I forget I like Lara's thought about the name of your Etsy store....how about Quilt Muse or even Quilt Musings. And I agree that your humble price is much too low! You deserve real compensation for your work and your talent! But no matter what I love the quilt! Your quilt is lovely. I think of the ocean when I look at it. Lots of movement in the quilting. I have used the Wool ease for hats and it is very soft and knits up quick. Have you thought of Musings of Me for a name? Found you thru Crazy Mom link party. Your quilt is beautiful, and definitely should sell for more than you're thinking. I found this entire comment section (conversation) very informative because I, too, have a hard time putting a price on my quilts. Good luck with naming your Etsy shop; I'll be looking for you! I also vote raising your prices - especially with beautiful quilting like that! Many of the baby quilts on Etsy have much simpler quilting and yours will stand out. Congratulations on the new domain name! Hi, I've enjoyed reading some very good etsy store name suggestions here such as Sandra's MMM Quilts. I also agree that the price of that beautiful quilt needs to be higher, $150.00 at minimum and we know that really doesn't even cover the cost of your labor at a fair wage. People looking to buy a quilt, look for quality and will pay more otherwise they'd make it themselves. Go after the buyer who will pay you more for your work. After all, when I need a really good article of clothing, I go to a really good store and pay the really high price, otherwise I just buy from Target or Wal-Mart or even a thrift store. My mamma always said "you get what you pay for." I love the feather quilting and I agree with Yvonne , your price seems too low . Mollie sparkles wrote a great blog post on charging . You're right about menopausal having connotations , like the midget in my blog name - concentrate on the musings ! 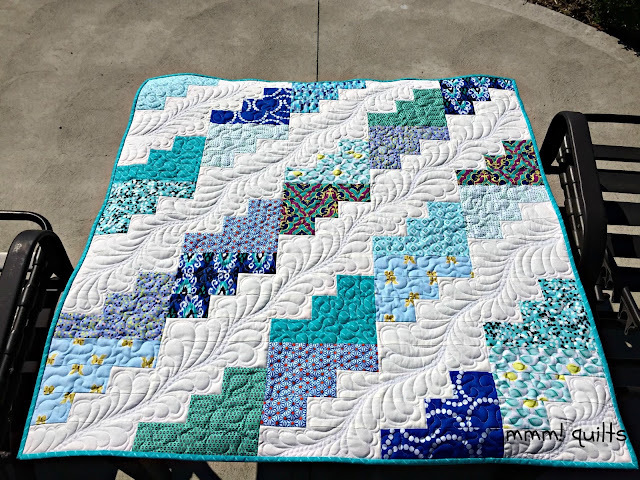 Looks great and the quilting is just perfect for it! Really catches the eye.